<Don’t Eat That! It’s Healthy! I sit, hands on keyboard. My entire being thrumming with chemically derived energy. I’m slightly dizzy. And I tell myself, as I’ve told myself every day for years now: Tomorrow, I’ll stop at two cups. But my love of the People’s Drug is too strong to moderate; almost as strong as the object of my affection. Every morning, before I’m fully dressed, before I’ve fed my dogs, two or three conscious breaths into the new day, I fill my kettle. This goes onto a burner, the same one every day. There it begins its steady climb to a temperature, which I’ve arrived at through trial and error on many mornings nearly indistinguishable from this most recent. Next come the beans, coaxed from their vacuum sealed container and ground at the last possible moment. Pulverized and devolved from their oily black beetle shells into something more akin to fresh cocoa. With a heft and density not unlike rich soil, the grounds are emptied into my implement of choice, an AeroPress, and there they await the microcosmic elemental forces that will transform them from the fruits of nature to the fruits of my ritual labor. If your beans ain't shiny like tiny scarabs, you don't want 'em. The water hits, the steam rises, the grounds release the gasses and oils contained within and deliver up an aroma that is no less luxurious than chocolate ganache. At this stage, the coffee is at its most crude, like distilling some petroleum product through an arcane, alchemical process. A dense, caramel-colored foam rests atop the soaked grounds—the bloom, as it is known to far more talented and knowledgeable crafters than myself. The brewing time is not long, a minute and a half after a stir or two gets me what I want. Then, after plunging the press of its liquid contents, I’m left with a puck of spent wonder. In my barely awoken state, I half-heartedly chide myself for simply throwing it away. Every morning saying, in the best kind of First World guilt tone: You should compost this. I never will. Instead, I’ll drink. My favorite cup of coffee. I make no claims to my endeavors being the “best” cup of coffee. In all my travels, I try to find a place to get a good cup. But when I’m away from home, I don’t drink a regular coffee. These are professionals and, as such, are capable of creating something far beyond my meager skills. Usually a macchiato, always a double shot. But when press comes to shove, I will always return to my method. It’s reproducible; it’s portable; it’s financially minimal; and, above all, it’s delicious to me. To have found something I enjoy so much and that costs me so little is a joy. Some have said, after I ply them with a cup, that they enjoy it quite a bit, but not enough to go through all the process and care to obtain it for themselves, by themselves. It is extra effort for a product that is usually consumed more for its beneficial stimulation than for flavor. And there are those who, when spending the money for a finer experience, usually opt for syrups and creamery to mask the central ingredient itself. To each their own. I sit in judgment of no one on matters of taste. What I enjoy is no better or worse than anyone else’s preference. 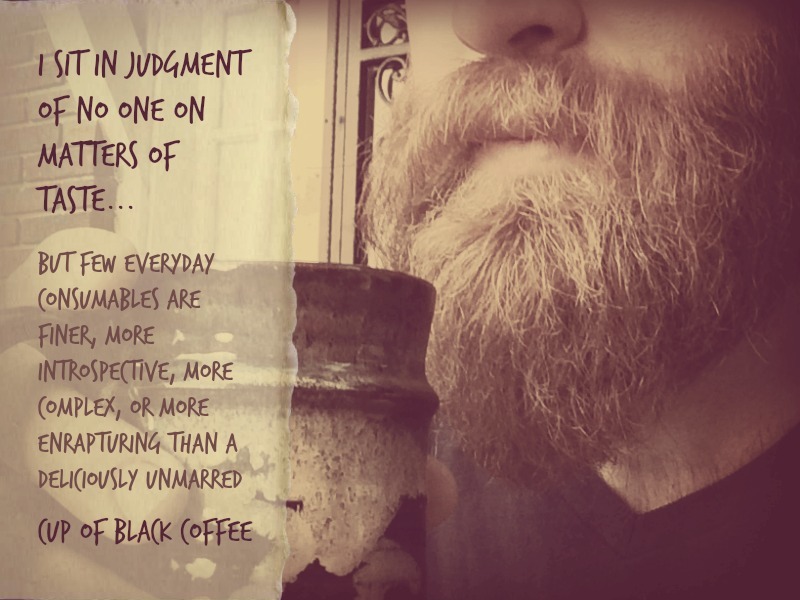 But if you were to ask me my opinion on this particular matter, I would tell you that few everyday consumables are finer, more introspective, more complex, or more enrapturing than a deliciously unmarred cup of black coffee. I think I’ll have another. Groceries bought, kitchen clean, best cup of coffee I know how to make. It’s the simple things in life, when looked at in joyful abandon, that bring such pleasure, thank you Ben and Sunnyhuckle for sharing a cup of coffee with me☺️ I remember a line from the tv series Mash spoken by Hoolihan who just wanted to be included by her fellow nurses and she disdainfully yells something like would it kill you to invite me for a lousy cup of coffee!! Not only did I receive an invite, I receive a rich cupful! Thanks again!